As Azerbaijan’s top player, Grandmaster Shakhriyar Mamedyarov has ascended to become one of the elite chess players in the world. He started off when he was young and became the only player ever to win the World Junior Championship twice. But he didn’t stop there. is incredible chess strength has helped him to win many tournaments throughout his career so far. Combining this with his unique style of aggressiveness, mixed with unusual opening decisions, has made him a very interesting player to watch in the chess scene. 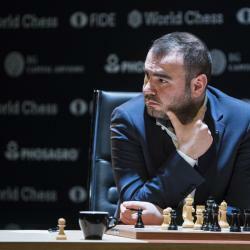 Shakhriyar Mamedyarov was born in Azerbaijan and learned chess at a young age. He became a Grandmaster in 2002 and quickly had many tournament successes. In 2003 he won the World Junior Championship and followed up winning the same tournament in 2005. He is the only player in history to win this tournament twice, and because of his second victory, he was invited to a large elite tournament in 2006. He won this elite Essent tournament and also won it again the following year in 2007. He continued to rack of tournament victories throughout the following years including winning the Aeroflot Open in 2006, the President’s Cup and Mikhail Tal Memorial in 2010 and the World Rapid Championship, Geneva Chess Masters and Beijing FIDE Grand Prix in 2013. Using his aggressive play style and unusual opening choices, Mamedyarov has shot up to now be mentioned among the top players in the world and will continue to be a strong player throughout the future.